Amanda Conner is just golden, as stated before! Her artwork is always spot on, never boring, intriguing, filled with the most details you can think of and then some, beautiful, character-piece, artsy at times but always a complete story on its own. 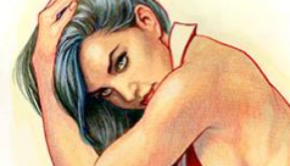 Whether you check her coverwork for Vampirella, Painkiller Jane, Supergirl or Harley Quinn… every cover has a story to tell and details to discover and sexiness to drool over! Vampirella was my first impression of her artwork and my life has never been the same, really.